Way Back Wednesday is a Meme that I created with the aim to write mini book reviews on books I have read in the past, that left an impression on me. You know what kind of books I am talking about…. The ones that you have read multiple times, and they still bring you nostalgia. Books like these are the reason you enjoy reading. So grab that old-dusty-yet-loved-book off the shelf, glance it over, write a mini review and join in with me on Wednesdays! EVERYONE is welcome to participate. 1.) Discuss a book you read in the past that left an impression on you. You can write a condensed review if you prefer. 3.) Link back to my blog. 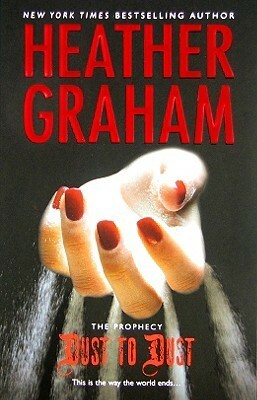 Today, my Way Back Wednesday post is devoted to the apocalyptic-fantasy-romance book, Dust to Dust, by Heather Graham. Not long ago, Scott Bryant would have described himself as an ordinary guy. But one act of heroism has changed his life forever; or at least until the apocalypse occurs. Because the end of the world is on its way. Suddenly and inexplicably possessed of superhuman strength, Scott finds himself allied with the enigmatic and alluring Melanie Regan in a quest to find the mysterious Oracle in hopes of averting the absolute destruction that threatens. Melanie herself has been falling into trances, sketching terrifying visions of future events;and she wants answers. She knows better than Scott where to look for help, but even she cannot fathom the powers that have thrust them together in an epic battle of good against evil. The earth itself will soon turn against its inhabitants, and now mortal and immortal must join forces if any are to survive. I’d be lying if I told you I don’t choose books by their covers…. I most certainly do, and Dust to Dust was one of those books. I LOVE the cover for this novel, and the title is appropriate for an apocalyptic fantasy. I don’t think I even bothered to read the book blurb, I liked the cover so much. I’m glad to say I wasn’t disappointed! Although, at the time, this wasn’t the type of novel I would have read, I enjoyed it very much. It had enough romance in it to hold my interest, (which was all I read at the time). “New York Times and USA Today best-selling author Heather Graham majored in theater arts at the University of South Florida. After a stint of several years in dinner theater, back-up vocals, and bartending, she stayed home after the birth of her third child and began to write, working on short horror stories and romances. After some trial and error, she sold her first book, WHEN NEXT WE LOVE, in 1982 and since then, she has written over one hundred novels and novellas including category, romantic suspense, historical romance, vampire fiction, time travel, occult, and Christmas holiday fare. She wrote the launch books for the Dell’s Ecstasy Supreme line, Silhouette’s Shadows, and for Harlequin’s mainstream fiction imprint, Mira Books. This entry was posted in A Well Read Woman Blog, Book Review, Disaster Fiction, Drama, Fantasy, Romance, Science Fiction, Way Back Wednesday and tagged A Well Read Woman Way Back Wednesday, AWRW Book Review, Book Meme, Disaster Fiction, Dust to Dust by Heather Graham, Fantasy, Romance, Science Fiction, Way Back Wednesday Book Meme. Bookmark the permalink.